It’s time to start thinking Thanksgiving, so what do you say we start with dessert? 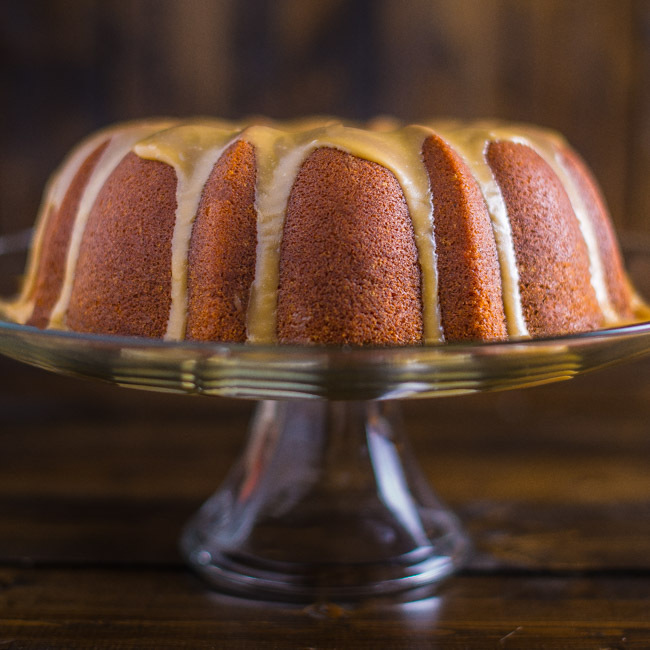 How about a Pumpkin Pound Cake with a Bourbon Caramel Glaze? First off, did you ever wonder why it’s called a pound cake? I always thought it was because it was made with a pound of butter, but actually the original pound cake recipe called for a pound of each of the four main ingredients: flour, sugar, butter, and eggs. It’s believed that the pound cake originated in England in the 1700s. The cake morphed over time and made it’s way to the southern United States where it is considered a staple among desserts. This cake is an adaptation of two recipes that I borrowed and put together.The cake recipe comes from my cousin, Mary, in Kansas. Her family has been making this pound cake for years. I modified it slightly to add pumpkin. My blogger friend, Katie Webster, inspired the bourbon caramel glaze. She creates amazing food with beautiful photography on her blog, Healthy Seasonal Recipes. In her post, she said her knees buckled when she tasted the sauce, and I totally understand why. This glaze and pumpkin pound cake are a marriage made in heaven. Hop on over and check her out, but be sure and come back for the cake recipe. I already had a caramel sauce recipe that I used for Pecan Turtle Brownies, but the addition of bourbon was brilliant on Katie’s part. My recipe is very similar to hers except that I add the slightest bit a lot of butter to the sauce. I mean, come on, the cake already has three sticks of butter. What’s a little more in the glaze, right? The bourbon and caramel flavors perfectly compliment the pumpkin in the cake. My grandmother made a delicious pound cake that was very dense and buttery. If I’m eating pound cake, I want it to be the same consistency as hers. I made this cake twice and the first version wasn’t dense enough for me. I used less baking powder the second time and it was perfect. For a less dense cake, you can increase the baking powder to one teaspoon. If you like putting a new twist on an old southern classic dessert, I suggest you add this cake to your Thanksgiving table. 2. In a medium bowl, whisk together flour, salt, baking powder, and pumpkin pie spice. 3. Place butter and sugar in the bowl of an electric mixer. Mix at high speed for 3 to 4 minutes or until butter is light and fluffy. Reduce mixer speed and add one egg at a time letting each one get incorporated before adding the next. Add milk and pumpkin and mix until combined. 4. Add flour mixture in batches letting each batch get incorporated into wet ingredients. 5. Pour batter into Bundt pan and lightly drop pan on counter top several times until top of batter is evenly distributed. Place pan in oven and bake for 55 to 65 minutes or until an inserted toothpick comes out clean. 1. Transfer sugar to a heavy medium skillet or sauce pan and place over medium high heat. After about 3 or 4 minutes the sugar will begin melting. When melting begin moving the sugar around the pan with a whisk. The sugar will begin clumping which is normal. 2. Continue whisking until sugar is completely melted. At this point begin watching very carefully as the sugar can burn very quickly. When the sugar begins turning an amber color, add butter and continue whisking until butter is melted. The sugar will bubble vigorously. 3. When the butter is melted, remove from heat and add cream and bourbon. Continue whisking until well combined. Add salt and whisk to combine. Let sauce cool until the consistency is suitable for glazing the cake. Whisk regularly while glaze is cooling. 4. When glaze has cooled sufficiently, drizzle over the top of the cake, letting it run down the sides. Oh my, but this sounds terrific. Pound Cake is really, I think, my favorite cake. So satisfying, and as far as I am concerned, the denser, the better. And the glaze well, I’d probably eat it right out of the bowl. This just sounds wonderful. This is such a decadent poundcake Bill – and that bourbon caramel glaze sounds terrific – reminds me of one a friend’s sister in law used to make – it was a rum-butter glaze she poured over a cranberry cake – -either on their own was “meh”, but the two combined were ooohlala.. a marriage made in heaven indeed! Lacking a Bundt pan (I know, I know) I’m going to make a pumpkin/cranberry upside-down cake but you can bet your biscuits it’s going to be served with this glaze. Fun website that reflects your passion for really good food. Give the pups some hugs from Boise. This glaze is great on most anything, Lizzie! Hope you like it as much as I do! Thanks for dropping by! Pumpkin? Check. Caramel? Check. Bourbon? Double check! All my favorite flavors in one great recipe. Thanks. I’m with you on the flavors, John. All my favorites too! Wish I had a slice of this pumpkin pound cake to devour right now.. it looks so delicious Bill, especially with all that bourbon caramel glaze over the top! What an absolutely beautiful pound cake Bill! I am in love with the gorgeous glaze! Just gorgeous! Cannot wait to try this recipe! Thank you! Thank you, Susan. I really appreciate you dropping by! Bill, I always have trouble getting pound cakes out of my bundt pan, I spray and spray and sometimes end up with truffle instead because cake breaks coming out of pan. Any ideas? Thank you. Hi Patty. My Bundt pan is non-stick and I’ve never have problem with sticking. You might want to try spreading softened butter on the inside of your pan and dusting it with flour. That’s always worked for me. Also, I would suggest cooling the cake in the pan a little longer before you try to remove it. Hope this helps. Thank so much for dropping by.